1. Make sure that jumper setting of your existing and new CD/HDD are not the same, otherwise both device cannot be detected by your system. Jumper settings is located at the back of the device. 2. 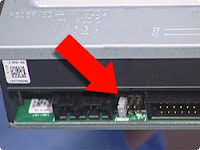 Make sure that IDE cable is inserted properly, remember that pin 1 will always be positioned beside the power supply connection of the device. If your system wont boot or blacked out after you insert a new CD or HDD, try checking the cable position.